July is rapidly coming to a close which means as much as I hate to admit it, school is right around the corner. You'll soon be starting to get your little ones ready to head off to school and with that comes a new challenge: the lunch box. Over the ten years I've taught as a kindergarten teacher I have seen it all. From a lunch box that contained nothing but cookies and chips, to one that contained a completely frozen lean cuisine. Lunch time is SO important for re-fueling and filling your little one with the nutrients they need to focus for an afternoon of learning. 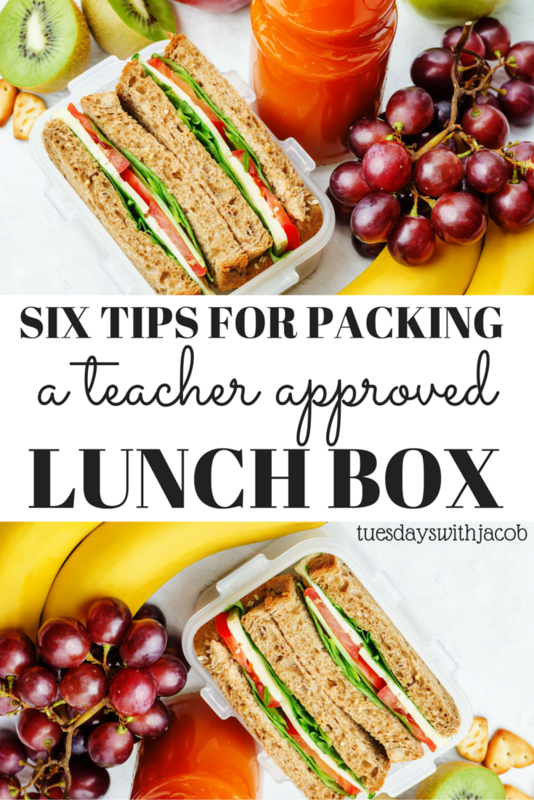 Here are my top tips for packing a teacher-approved lunch box! 1. Make sure your child can open everything independently. Most schools have one or two lunch aides helping in the cafeteria if they are lucky. Most also have an entire grade level eating at the same time which means the staff to student ratio can be anywhere from 1:50 to 1:200. As you can imagine, your child might be waiting a bit if they need help. Making sure they can open everything on their own will give them their full time to eat. Practice, practice, practice ahead of time! Can they pull back the cover of their lunchable? Get their straw out of it's plastic casing and into the juice box? Can they successfully open and close their thermos, Ziploc bags, and plastic ware? Independence in the lunch room is our goal! Some schools have utensils available, most don't. Send a fork or a spoon if your child will need it for soup, yogurt, noodles, etc. If your child will need a utensil for snack time also, send two. Chances are the utensil they use at lunch time will get thrown away and then they won't have one for snack time. Re-usable metal utensils are awesome but make sure your child really understands that they are not to be thrown away, perhaps designate a special pocket or compartment of the lunch box just for them. If your child's class will have snack time find someway to designate the snack as something that should not be eaten at lunch time. You could keep it in a special reusable snack bag or container, or keep it in the backpack, out of the lunch box all together. If the snack is in the lunch box with the rest of the food, chances are your child will eat it at lunch time and then have nothing to eat at snack time. Most schools do not have a microwave or the adults to help with one. Don't send anything that will need to be heated up. If you are sending something warm, invest in a good thermos and it will keep your child's food warm until lunch time! On the reverse, make sure you plan to keep the lunch box cold. Most teachers don't have fridges in their rooms for students to keep their lunches in. You can either use an ice pack, or a great tip is to freeze a yogurt tube! The yogurt tube will keep the other food cold and will be thawed out by lunch time! Lunch time is often the only chance your child has to refuel for a full 8 hour day (or longer!) of learning. As teachers, we really need your child to eat so that they can focus. A hungry child is not going to be able to keep their mind on anything other than their empty stomach. Please, please, on behalf of teachers everywhere, send food you know your child likes. If you want to introduce your child to new foods, try them out at dinner or on the weekends. THEN, if your child likes them you could send them in their lunch box to school. We're looking for a well rounded lunch here, ideally one that is high in protein and low in sugar. Sugar gets your child's body all jazzed up (I promise their teacher doesn't want that) and then leaves it to crash and burn. A child that has crashed and burned from a sugar high is not going to be able to accomplish anything, let alone their school work. A little sweet here or there, maybe on a Friday as a special treat is fine, but try not to load the lunch box up with junk food. And one more, BONUS tip! This doesn't happen all that often, but if your child's teacher gives out any information regarding allergies in the class, FOLLOW IT. Your kid may love peanut butter, but it's not worth risking another child's life. Our goal as teachers is to keep everyone happy, safe, and learning at school. Following any instructions regarding allergies will help us accomplish that. If it was your child, you would want the same. Hope you find these tips useful as you start assembling school lunches, and I wish you all the most wonderful school year!! 34 comments on "6 Tips for Packing a Teacher Approved Lunch Box"
Great tips for packing school lunches! YES!! I'm a teacher too, and LOVED reading this! I've definitely had some students show up with nothing but chips and soda in their lunch boxes. Refueling is SO important, especially for the little ones. They put in a long day, and a healthy lunch keeps them going until the end! that sandwich looks amazing! midnight snacker over here :) these tips are so great with henry starting pre-k next month! These are great tips and will come in handy once my son goes to school- thanks for sharing! Awesome tips! The including everything needed is a biggie for my daughters school. They get so annoyed if I forget to give her a spoon or something ha! That's a great tip on making sure they can open everything independently. This will be our first year with a child in school and I can use all the help I can get! I used to teach elementary school. These are excellent tips! I had a microwave and fridge in my room for my use only. They knew both were off limits. My son is going to school for the first time this fall and I am so lost. These were really helpful tips that I had not thought of, so thank you! Nail on the head! Excellent job! OH my goodness. This is such an amazing post! I am a school counselor (I taught kinder for 3 years) and every day I have kids asking me to open things for them and more. Not to mention with all of the peanut allergies... Love it! Wonderful tips which I would think would be automatically thought of, from experience at schools they are not. Hope more parents read and use. Great tips! I hate having to try and find a microwave! These are great tips! Packing lunches is one of my least favorite things to do when sending my kids off for the day. Thank you SO much for this! My son just started Kindergarten this week and he will be bringing his lunch everyday. These tips are super helpful. hahaha oh my goodness spoken like a true teacher. the microwave one gets me everytime! Yes! Loved this. I am trying to come up with new lunch ideas - I feel like I send the same thing each time. It's so true that you need to think about them opening things. Great tips! Great tips! I have to admit, packing lunches is my most dreaded chore during the school year! Great tips! I love that you include information about allergies and being sensitive to others' allergies! I love this! I'm a teacher and agree with all of these, especially the one about being able to open everything! So many parents send the gogurt and that's great but kids can't open it. Teachers do not walk around with scissors! Great tips, especially about the utensils! My kids are still not at the lunch packing age, but pinned for kindergarten next year! I'm a teacher also. Most days I cringe at what I see my students eating. I so appreciate you making this post! 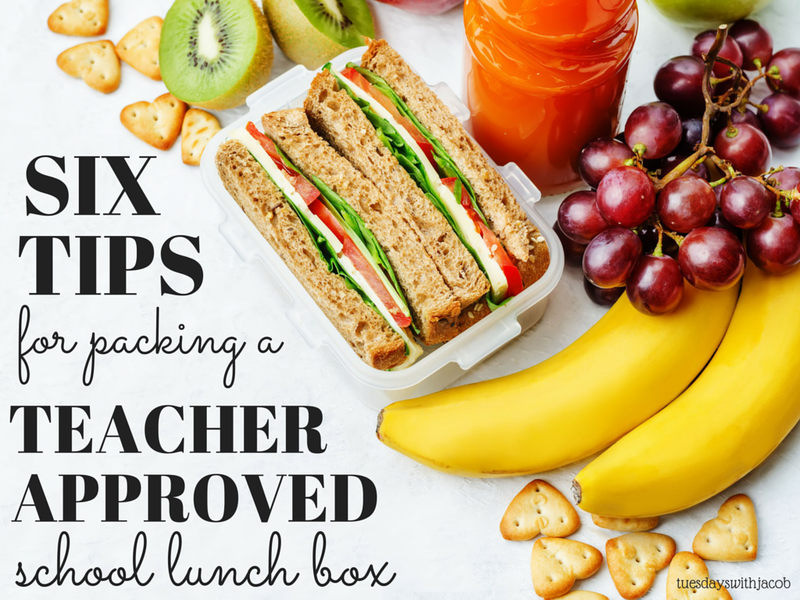 Thank you so much for these great tips... For right now my son only brings a snack (he's in preschool), but it's so nice to hear things from a teacher's perspective! These are great tips! I have to pack a lunch for Ellie every day and I hate doing it! I try to always pack her main food, a fruit or veggie, a snack, something crunchy, and then a fruit snack if she finished her dinner the night before. I love this perspective, as these types of article always seem to be written from the parents' point of view! Great tips! You don't hear a teacher's perspective eon this often! This is a great post! I love the tips and they are so helpful! This is SO great! My daughter will be in first grade next year and these tips are well-appreciated!